Looking for a lift for your loose, saggy skin? Ultherapy may be just the solution! The FDA-cleared device used in the procedure utilizes the safe, time-tested energy of ultrasound to stimulate the deep structural support layers of the skin—including those typically addressed in a surgical facelift—without disturbing the surface of the skin. Ultherapy can improve loose or sagging skin on the face, neck (also known as “turkey neck”), and décolletage. Results will unfold over the course of 2-3 months and some patients have reported continued improvement for up to 6 months. While ultrasound does not duplicate the results of surgery, Ultherapy has proven to be an inviting alternative for those who are not yet ready for surgery. Pricing will be determined during your complimentary consultation. Ultherapy is a non-surgical face treatment that uses ultrasound to actually lift and tone loose or sagging skin without any downtime. What is unique about the Ultherapy procedure? Ultherapy is the only non-invasive treatment that can specifically target the deep foundation below the skin – typically addressed in cosmetic surgery – without cutting or disrupting the surface of the skin. It also is the only procedure to use ultrasound imaging, which allows us to actually see the layers of tissue we target during the treatment and ensure the energy is deposited precisely to where it will be most effective. A good candidate for Ultherapy is someone with skin that has “relaxed” to the point of looking, and often feeling, less firm. A lowered eyebrow line or sagging skin on the eyelids, for instance, is often the first sign of “maturing” skin. Typically, those in their thirties and older who have mild to moderate skin laxity are candidates. While Ultherapy is not a replacement for a surgical face lift, there are many people who want some lifting but are not ready for surgery, either mentally, financially or logistically. There also are younger people who want to “stay ahead of the game” as well as those looking to prolong the effects of cosmetic surgery. 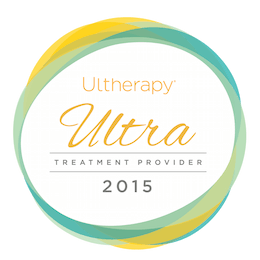 Ultherapy addresses mild to moderate loose or sagging skin. Specifically, by reconditioning and renewing the skin from within, Ultherapy will lift the brow, which in turn reduces excess skin on the lids, opens up the eyes, and gives a more refreshed look overall. The majority of patients only need one treatment; however, some may benefit from more than one treatment (depending on how much laxity they have and their body’s own biological response to the ultrasound and the collagen-building process). Comfort thresholds vary from patient to patient, but there can be some discomfort while the ultrasound energy is being delivered. This is temporary and a positive signal that the collagen-building process has been initiated. We will consult with you prior to your skin treatment to make your experience as pleasant as possible. Patients typically leave comfortable and excited about the benefits to come! There may be slight redness for up to an hour or so following the treatment, and a small percentage of patients may have slight swelling, tingling or tenderness to touch, but these are mild and temporary in nature. There is always the possibility for other less common post-procedural effects, which we’ll review with you.